Home » Uncategorized » EPIC Numbers for “Apollo’s Curse” AND still time to get in on the Bradsgiving sale! EPIC Numbers for “Apollo’s Curse” AND still time to get in on the Bradsgiving sale! I mean, wow. On the last two BookBubs, with .99 titles, I got about 800 sales on day one and 200 on day two. Obviously there is a vast difference in people’s minds between .99 and free. 6,300 downloads on day one. 345 so far this bright and early morning. I also took the advice of a fellow writer and did Kindle Countdown deals on my other books. And yeah, I’ve definitely seen a jump in sales from the combo of “Apollo” free and the others on sale. 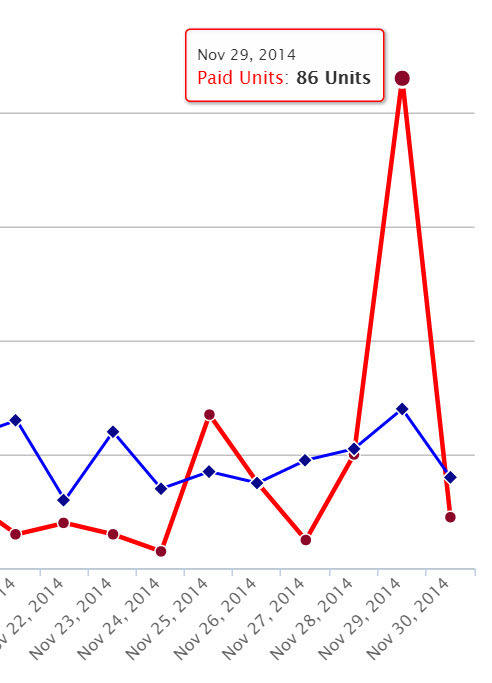 The red line is sales, the blue line is Kindle Unlimited borrows. So, there’s a chance that blue line may pop – I’m told that if people with KU subscriptions clicked on the “Read for free with KU” button for “Apollo” instead of the one-click “buy” button for the freebie, I’ll get KU borrow credits. But they have to read 10% of the book before the ‘zon gives it to you as a borrow. I wonder how many people actually read their freebies. It’s easy enough to download one, and if you’re like me, you’re always overbuying books and then, eventually, triaging which ones you’re actually going to read, and getting rid of the rest (so you have a bare shelf and thus the excuse to buy more LOL). That said – I got to #16 in the Kindle Free store! Which TBH I’m happy about, but also worried about. “Angelina Vance” gave away a lot of free copies of her novel, and it didn’t translate into $$$ when it went to paid. But, it was free for a long time, and it felt to me like anyone who wanted it had a chance to get it free. And, unlike me, Angelina didn’t have a backlist which a massive freebie could promote. “Apollo” is only free for two days, so it’ll be interesting to see if/how that translates into actual bucks. OH YEAH! I almost forgot to log the floggin’! 🙂 Still 12 hours to Complete Your Library of Brad Vance Novels! “Apollo’s Curse,” **FREE** till midnight Sunday! 75% off “The Worst Best Luck”!